One of the many ways in which Johnson College and BlackOut Design have been working together is to increase awareness of the wonderful opportunities available at Johnson College. Our latest project has been to design and implement billboard advertising for their Open House campaign. 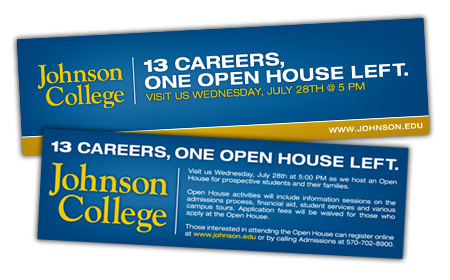 Johnson College offers education for various careers in technology, health services and business fields. They have focused on 13 degree programs in order to provide personalized instruction so that their students will graduate with the skills needed for specialized employment, career advancement and life-long learning. BlackOut Design has been thoroughly enjoying the opportunity to better spread the word about such a dynamic institution with strong competitive advantage and client satisfaction.